Shawarma is a sandwich wrap of Middle Eastern origin, usually made out of spit roast shaved meat of beef, lamb, goat, chicken and turkey mixed with tabouli salad and/or fattoush salad, tomatoes and cucumber This is the Middle Eastern counterpart to the ever famous American Burger where its a staple fast-food item not just in those countries but as well as in Europe. Shawarma might look similar to other dishes such as the Greek “gyros”, Armenian “Tarna” or the Turkish “doner kebab”, don’t be puzzled as they are all the same just named in their local languages in which all of it means either “to turn”, “turning” or turned”, just like the meat used in Shawarma is prepared. 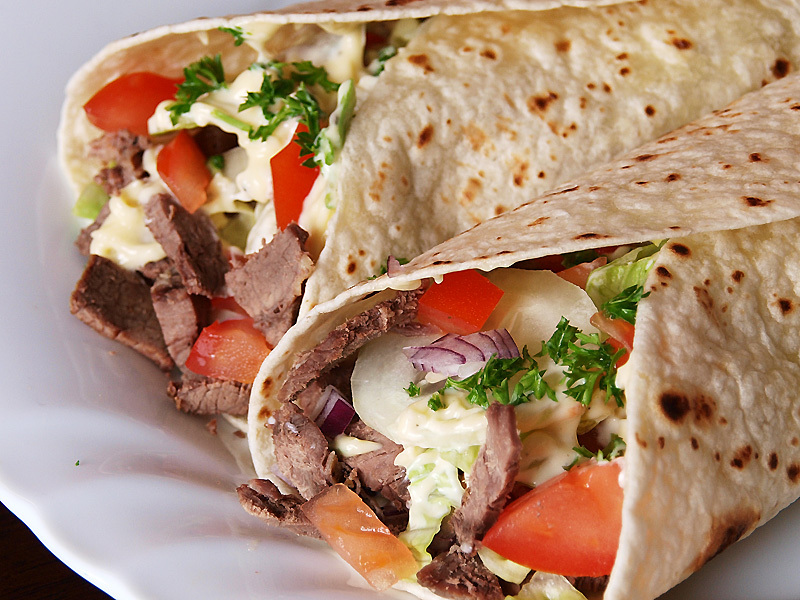 I used to love eating shawarmas – I’m really looking forward to trying your recipe. I used to be addicted to Shawarma! I need to make these I have some left over grilled steak that would go great in it. Thanks for stopping my by blog. in turkey this is called doner not shawarma.